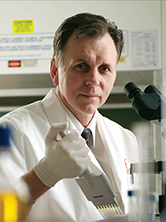 Professor Barry Marshall has been ADFA’s Scientific Patron since October 2013. In 2005 Barry J Marshall and J Robin Warren were awarded the Nobel Prize for Physiology or Medicine in recognition of their 1982 discovery that a bacterium, Helicobacter pylori, which affects 50% of the global population, causes one of the most common diseases of mankind, peptic ulcer disease. Their work is acknowledged as the most significant discovery in the history of gastroenterology and is compared to the development of the polio vaccine and the eradication of smallpox. Along with the Nobel Prize, Prof Marshall has received many honours for his work on Helicobacter pylori, most notably they include, The William Beaumont Prize in 2006 (American Gastroenterology Association), in 1995 the Albert Lasker Award (Albert & Mary Lasker Foundation), and in 1998 the Dr. A. H. Heineken Prize for Medicine (The Alfred Heineken Foundation, Amsterdam). In 2007 Prof Marshall was awarded the honour of Western Australian of the year and The Companion in the General Division of the Order of Australia (AC). Prof Marshall holds professional memberships with the Australian Academy of Science, the British Royal Society, the Institute of Medicine (USA), the American Gastroenterological Association, the Australian Gastroenterological Society and the Australian Medical Association to name a few. In June 2016 Barry was the keynote speaker at the Gastro-Intestinal Disease Conference held in Antananarivo, Madagascar which was organised by Australian Doctors for Africa. Attended by several other international speakers and nearly 300 delegates, the Conference made recommendations to extend research and provide a way forward for the reduction of gastro-intestinal diseases in Madagascar. Haile Gebreselassie was appointed our Ethiopian Patron in April 2018 to increase the profile of ADFA within the Ethiopian community, both in-country and internationally. Haile Gebreselassie is a famous long distance running champion and is considered Ethiopia’s greatest ever athlete. He is an Olympic and World Champion, winning two Olympic gold medals at 10,000 meters and four world championships at the same distance. He won the Berlin Marathon a record four times, the Dubai Marathon twice and the 2001 Dubai Half Marathon. He has broken 61 Ethiopian records in the course of his career in distances from the 800m to the marathon and set 27 World Records, ranging from the 1500m to the marathon. He is considered by many to be the greatest long-distance runner of all time. Haile and his wife Alem have built a very successful business, Haile & Alem International. Their business interests include offices in Addis Ababa and other cities, hotel resorts, a cinema, fitness centre and spa, honey, coffee and the dealership for Hyundai cars in Ethiopia. 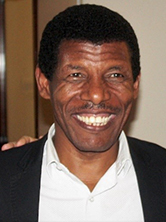 Gebreselassie is also a philanthropist and has built two primary schools in Ethiopia. He’s involved with the Great Ethiopian Run, an annual 10-kilometre running event held in late November in Addis Ababa.